Gotcha! 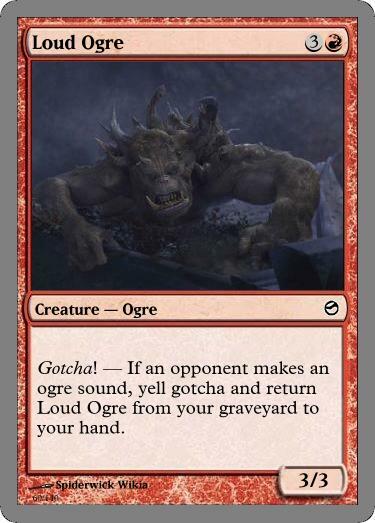 — If an opponent makes an ogre sound, yell gotcha and return Loud Ogre from your graveyard to your hand. Somewhat of a running joke from the Unforgotten Realms series. I always liked the Gotcha! mechanic, so I just put the two together. 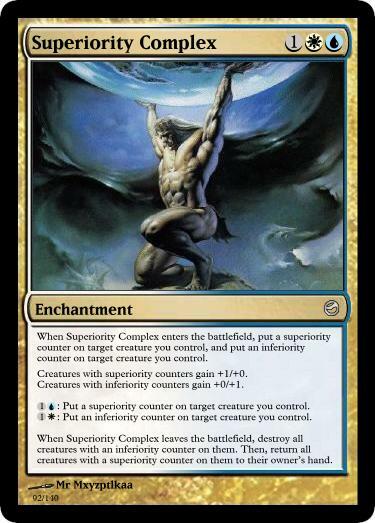 When Superiority Complex enters the battlefield, put a superiority counter on target creature you control, and put an inferiority counter on target creature you control. Creatures with superiority counters gain +1/+0. Creatures with inferiority counters gain +0/+1. 1U: Put a superiority counter on target creature you control. 1W: Put an inferiority counter on target creature you control. When Superiority Complex leaves the battlefield, destroy all creatures with an inferiority counter on them. Then, return all creatures with a superiority counter on them to their owner’s hand. Okay so this card actually came to me in a dream. This one and the next one. 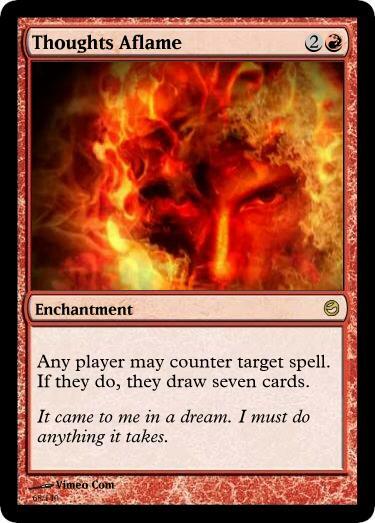 I can't exactly remember what went down in the dream I just remember this card was a huge enabler for some kind of crazy combo that was going on. 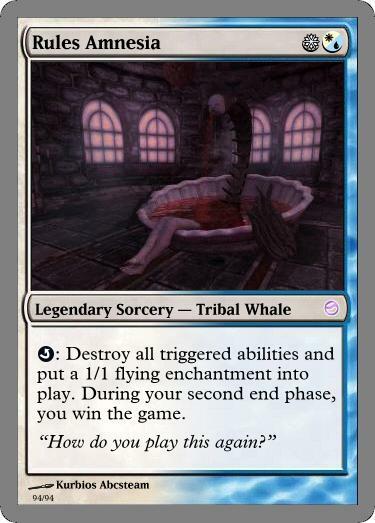 So I made the card in my dream into a real one. Any player may counter target spell. If they do, they draw seven cards. Obviously not in color at all. But whatever, I dreamt it. So crazily busted in burn, turns cantrips in legacy into 7-draws. Basically Wheel of Fortune at will. Not the kind of thing that would be printed. Ever. Well that's all I have for today. Yes I know it's 1 card shorter than what we usually do, but we'll make it up to you somehow. Remember, we started this by only doing two cards at first.